Handmade in France's Laguiole region, these genuine Laguiole en Aubrac waiter style corkscrews are favored by sommeliers around the world. Each piece is expertly assembled by a single master-craftsman from start to finish, ensuring that every en Aubrac corkscrew is unique. The worm and built-in serrated foil cutter are forged from ultra-strong brushed stainless steel. Arrives in a protective ebony wooden storage/gift box. Each corkscrew comes with a certificate of authenticity and a lifetime manufacturer's warranty. Can the box be personalized? 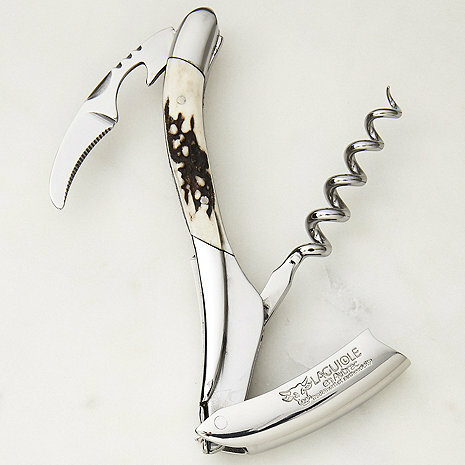 Ordered for a gift and my only complaint is that the horn on my corkscrew looked nothing like that in the picture. I realize that horn is a natural substance but I was not prepared for the complete difference in color. The one I received was overall beige, not black and cream like the one in the picture. I probably would have asked to exchange it but I was out of time. The person I gave it to was thrilled with it so all turned out fine. Love the corkscrew. Wonderful workmanship. I travel to Southern Chile and fly fish in the Andes. This is perfect for uncorking wine with that streamside lunch.